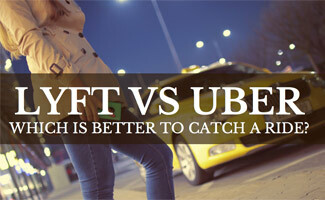 Home > Travel > Ride-sharing > Lyft vs Uber for Passengers: Who Wins the Rideshare Race? Tired of trying to hail a cab but need a ride on the fly? Don’t live in an area where it’s easy to catch a cab? Looking for an alternative to driving for a night out on the town? Try Uber or Lyft, the two most popular ride-sharing services that are both excellent alternatives to a traditional taxi. The ease of using Uber and Lyft is almost too good to be true. But times are changing, folks — so much so that taxi services are feeling the market squeezed by these services. Uber and Lyft dominate the market for easy, on-demand rides. You simply beckon with a mere click on your smartphone. Lyft launched in 2012, and after just four years in business, it’s starting to give ride-hailing giant Uber a run for its money. Lyft has expanded quickly into more than 200 cities and 31 states in the U.S. Lyft has its devoted followers, who are typically looking for a more casual, quick ride to their destination. Lyft doesn’t offer the kind of high-end rides, like Town Cars, that Uber is known for. The following are Washington, D.C. rates as of Jan. 26, 2016, for Lyft’s most basic service; however, rates change fairly frequently. Get $11 off your first Lyft ride via this link - coupon code lyftaff will automatically be added for you. Since its inception in 2009, Uber has dominated the independent transportation/ride-sharing market. Uber is located in 68 countries around the world and has a huge presence in North America — nearly 200 larger to medium-sized cities and locations where there are large university campuses. The following are Washington, D.C. rates as of Jan. 26, 2016, for Uber’s most basic service, UberX; however, rates change fairly frequently. Get $15 off your first Uber ride - all you have to do is sign up via this link! For passengers, Uber and Lyft work in pretty similar ways via their smartphone apps. Watch this quick one-minute video which gives you some inspiration on why you might use a ride sharing service. Lyft and Uber are pretty comparable in a majority of categories including customer service, off-peak pricing, ease of use and app performance. Lyft has less geographical coverage, but they’ll also save you money during peak driving times. One of the biggest differences between Uber and Lyft is the ride experience. If you’re looking for a more casual, sit-up-front, chatty kind of ride, Lyft is for you. It’s not that you can’t find friendly Uber drivers, but overall the Uber ride experience and company vibe is more professional. For some people, this could be perfect; for others it could be too stuffy. While both Lyft and Uber are committed to providing an alternative transportation option, Lyft’s mission is geared more toward the positive environmental impact that results from ride sharing, according to Lyft CMO Kira Wampler as quoted in a National Public Radio article. Fewer cars means a reduced footprint on our planet. This focus may be enough to sway some potential riders to go with Lyft. As you can see, there’s no clear winner in the Uber vs Lyft showdown. Each has its pros and cons, and it really comes down to availability in your location and what kind of ride you’re looking for. We highly recommend both Uber and Lyft for the would-be rider. If you’ve tried both Lyft and Uber, do you prefer one service over the other? Are Uber and Lyft owned by the same company? I know on the surface it looks like they’re not but I’ve heard that companies can hide behind different corporate structures and make it look like they’re separate entities when really they’re run by the same parent company. Have you guys thought to investigate this? Ronis, I don’t believe Uber and Lyft are owned by the same company. Possibly there is some overlap as they are both tech start ups and similar business models but as far as we know they are privately held companies with separate owners. I only take Lyft now, having heard so many bad things about Uber in the news and how they run their company (not to mention their political affiliation). Plus a driver told me that Uber uses it’s own navigation system, why can’t they just take you the fastest route using Waze? Thanks Sally for the insight into both companies, I am considering making a little extra money on nights and weekends and just got a new car so figured this would be a good way to pay it off. On Lyft, you say “Driver tipping is not required but is an option” do you make money purely off the base fare then? Hoping that Uber riders who aren’t used to tipping don’t accidentally not tip. Also, you mentioned a $5 cancellation fee, is that charged to the driver if they cancel? Didn’t realize there was a cost for that! Thanks for your questions! This article is geared toward Lyft and Uber passengers. Please see our Lyft vs Uber article for potential drivers. This article will answer your questions about pay and give you more information about becoming a driver for either service. Also, the $5 cancellation fee is charged to the passenger, not the driver. Good luck! It can be a great way to earn extra money!